I won’t pretend this is a great hike. 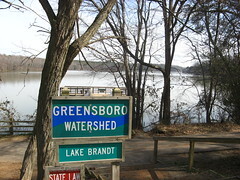 But it’s not too bad when you consider it’s entirely with the city limits of Greensboro, population 255,000. Owl’s Roost Trail snakes along the shores of Lake Brandt, part of the Grennsboro Watershed system. This 4.3-mile single-track was once voted the best urban mountain-biking track in the country, so yeah, you’ve gotta share with the fat-tire crowd. It’s also an official section of the Mountains to Sea Trail. 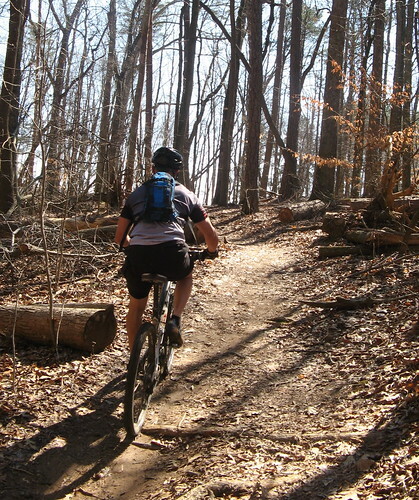 The city of Greensboro publishes a 44-page pamphlet with maps for all of its trails and greenways, which are built primarily for joggers, bike riders and families on picnics. The Watershed section stands out because the trails track prime lakefront property that’s being kept wild to prevent the lakes (which supply the city’s drinking water) from filling up with mud. 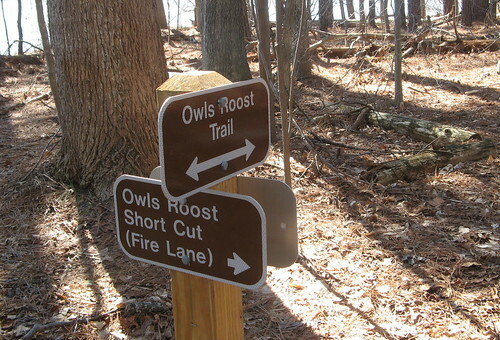 Owl’s Roost Trail seems roughly representative of the Watershed section. It’s well marked and well-maintained. 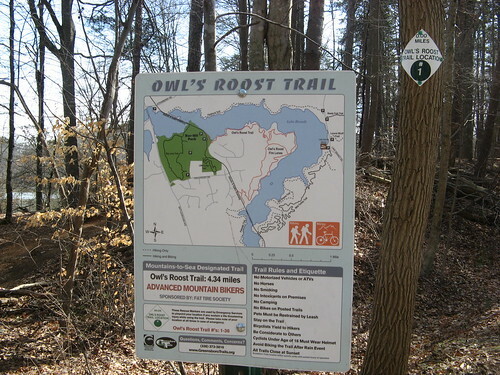 Best way to hike Owl’s Roost is a five-mile loop starting from Bur-Mil Park (the trailhead is next to the large fishing/viewing deck looking over Lake Brandt). 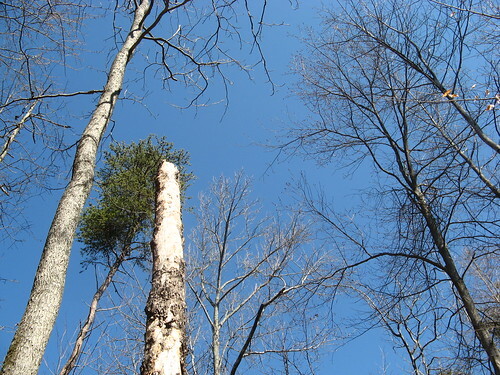 The trail has a lot more ups and downs than you might expect, so it’s a bit of a workout. I’d rate it moderate (vs. easy). Here’s the sign at the trailhead. 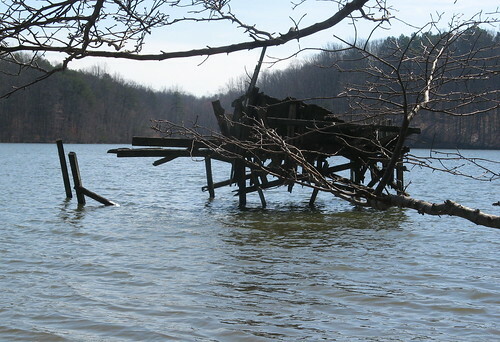 Decrepit structure of some kind. Several shortcuts allow you to shave some distance off the hike. One of a dozen or so mountain-bikers I saw. Not too bad for a Saturday, but it’ll no doubt get busier as summer approaches. 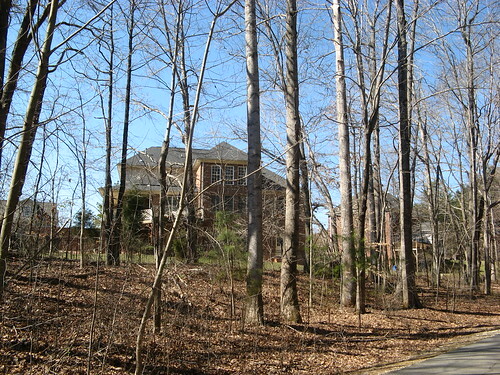 When you get back to the Greenway, turn right at the McMansions and head back toward Bur-Mil Park. 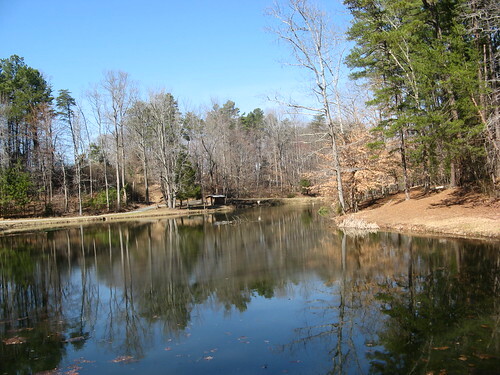 Pretty pond in Bur-Mil Park. 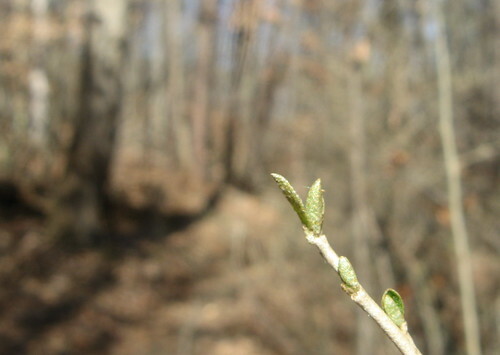 Danny Bernstein hikes the Mountains to Sea Trail in the Greensboro Watershed. 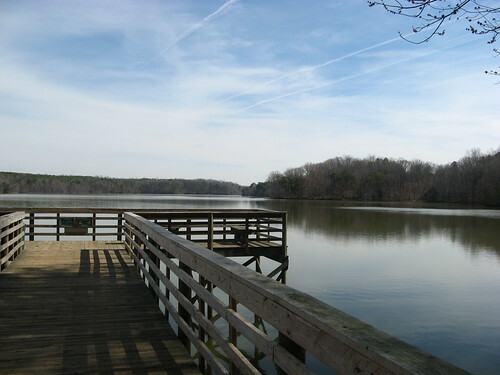 Greensboro trail system home page.